At Nutti Sámi Siida in Jukkasjärvi, a reindeer named Bulmmot eats from my hand. I have a handful of fodder pellets and Bulmmot seems to like them about as much as I like a bag of candy. Bulmmot is North Sámi for grey sparrow. His coat, in different nuances of grey, is the same colour as the little bird. A castrated bull, he is also named for the grey sparrow because he is small, lazy and a bit fat. His attitude is also similar to that of a grey sparrow. 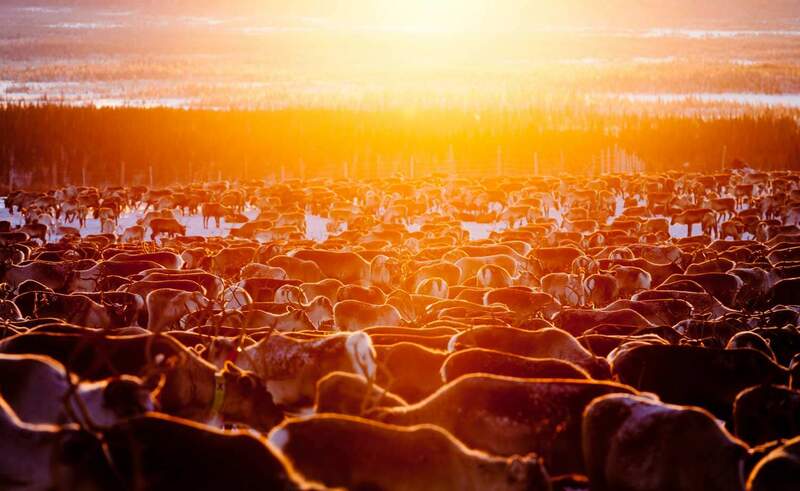 There are about 20 reindeer in Nils Torbjörn Nutti’s paddock in Jukkasjärvi. All have names and each is named according to their disposition, their appearance or their significance for Nils Torbjörn. Here, we meet Linis and Girjak, and Dábaláš, meaning common, which seems a little unfair. Dábaláš is beautiful. 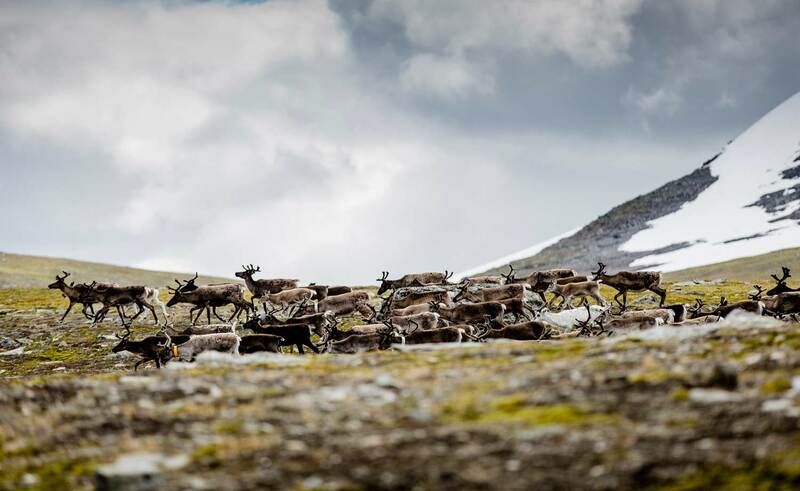 We also meet Áddjá Muzet, ‘great-grandfather’s dark-brown’, the last reindeer to bear his grandfather’s earmark before Nils Torbjörn took over the herd. The Sámi language is very descriptive. My pet’s name, Frasse, reflects the limited extent of my imagination. But the name Bulmmot reflects the animal’s character and personality. When the pellets in my hand are all gone, Bulmmot wanders off, back to the herd, where he is happy. That’s not unusual. Your dog, who you love more than you can imagine, will still be happier in the company of other dogs. Humans’ relation to domestic animals is always different than the animals’ relation to their human masters. It’s just that we don’t understand it. 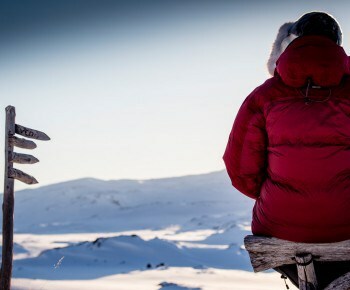 But for the Sámi, the reindeer is not merely a domestic animal, a pet or a companion; it is the foundation upon which their culture and lifestyle are based. 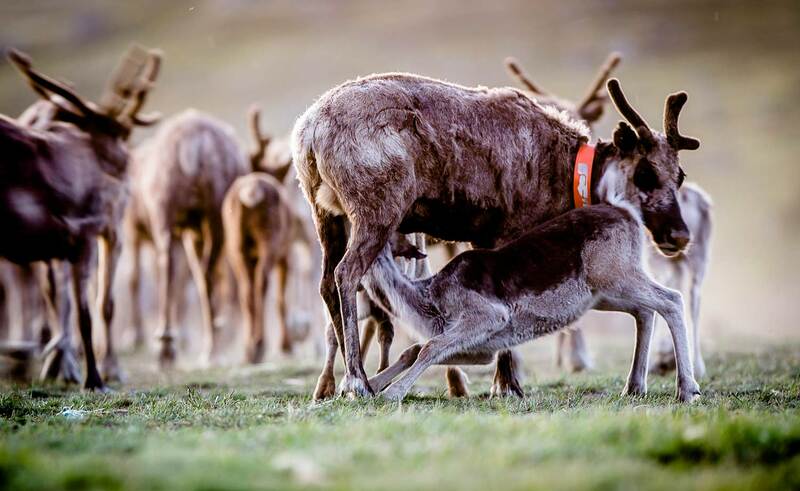 Between the Sámi and the reindeer, there is a promise; they will care for each other for all eternity. Shed antlers. Not only the fat of the reindeer is part of a cycle, so are the antlers. The bulls shed their antlers in late autumn. Neither blood nor energy is lost through the antlers in the cold of winter. The cow, the female, however, keeps her antlers. This allows her to protect her offspring from predators, but also to keep antlerless bulls away from her fodder. Craftsman Jon Tomas Utsi sits in a workshop in Porjus working on an engraved piece for a bone-handled knife. 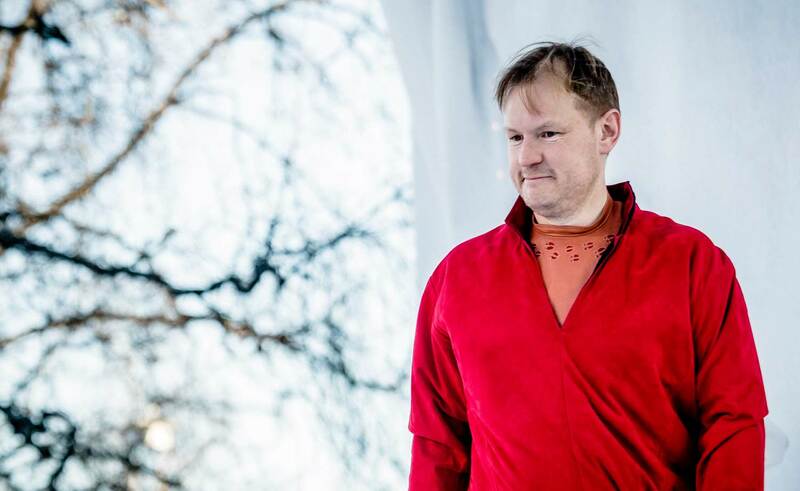 Jon Tomas has crafted traditional Sámi artefacts all of his life, as did his forefathers. 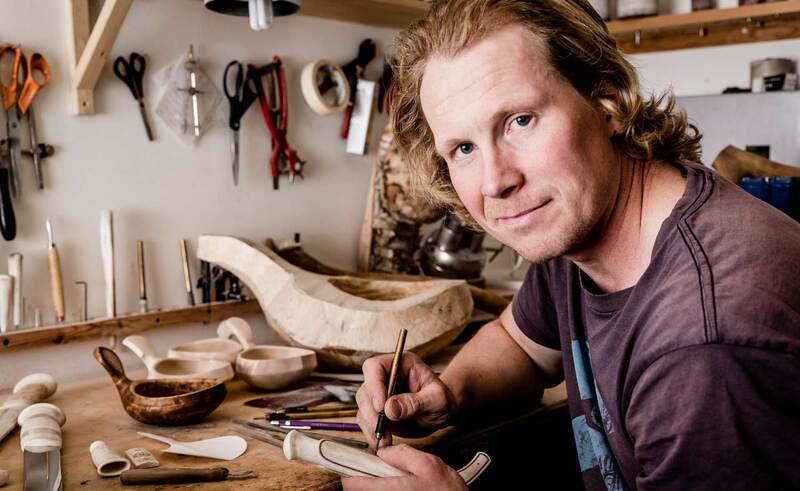 He began selling his works at the Jokkmokk winter market at the age of ten. And it was in Jokkmokk that he studied his craft and later became a teacher at Samiska Folkhögskolan for a while. Here, in Jokkmokk, his works are always exhibited at the Ájjte museum during the market. Jon Tomas gathers all of the materials himself and he works mostly in burl*, curly birch and reindeer antler, of course. We chat about reindeer antler and I am a little surprised when he says that he only works with shed antler, and that it makes no difference if it has been lying on the ground. – How do you mean? Isn’t it degraded by the elements? – No; in fact, it isn’t. The antlers just get a bit more patina. Of course, there’s a limit to how long they can be exposed to the weather and wind, but that just gives the material more character. Jon Tomas’s family were forced to move from Karesuando in the early 1900s. His great-grandfather brought his herd and his children to Vájsáluokta in Sirge village. While he combines different traditions, Jon Tomas has also added his own individual touch. 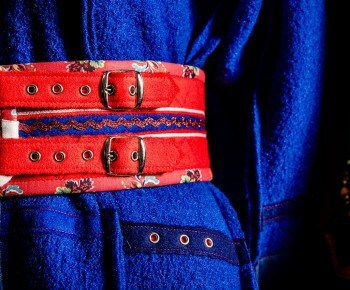 His work is Sámi duodji, genuine Sámi craftsmanship, and his engravings and ornamentation also follow Sámi tradition. In addition, he decorates his knives with fantastic reindeer motifs. This type of art, crafted from recovered shed reindeer antlers, has been his principal source of income since his youth. This is a beautiful form of recycling and sustainability. A reindeer herd is a sort of matriarchy. A cow decides. It is the leader cow who knows, or decides, if the ice will hold and when it is time to migrate from the fell country to the lowlands. It is the leader cow who knows when it is time to return to the calving grounds in the spring. The leader guides her herd through eight shifting seasons of the year. I tell my good friend, reindeer herder Lennart Pittja, that I think it is a little strange that the female is clearly the leader of the herd but, where people are concerned, the Sámi world seems to be more of a patriarchy. – Yes, we haven’t quite progressed that far yet, says Lennart, laughing. – That’s a rather interesting thought. On the other hand, we need to be honest; patriarchy is a product of the agrarian society, stemming from a time when families had many children. Perhaps we Sámi were the last to live that way. – Indeed, that is probably the case, but I really just said it as a passing remark. No harm intended I say, trying to let it pass. – I know, but an entire life of ‘passing remarks’ might make some of us a bit sensitive, counters Lennart. I understand him. At his home in Gällivare, we sit in silence. We have to be careful with our words. The apartment in Gällivare is hardly Lennart’s real home. Instead, it is merely a place to stay, because the ‘modern world’ demands it. The kids have to go to school, forms have to be sent to the tax authorities, the car has to be taken in for motor vehicle inspection, and the hairdresser is fully booked before Christmas. The list goes on and on. We drink our coffee. I place a bit of meat in my cup. Lennart smiles. 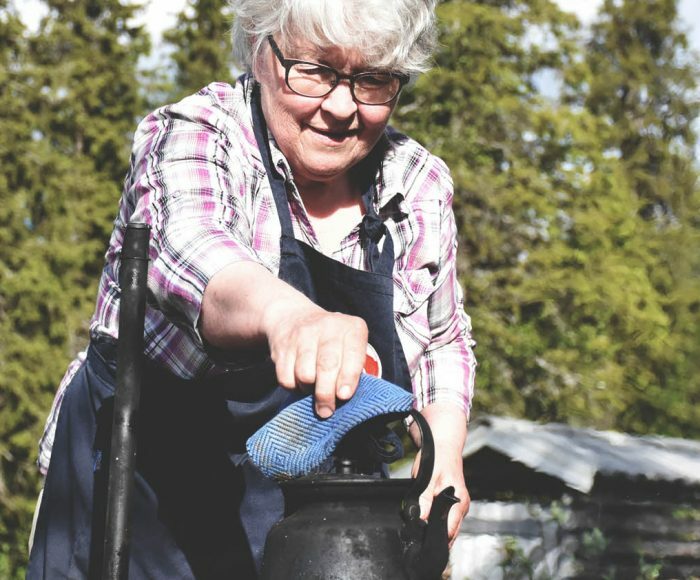 Sårkåjaur, near the Norwegian border, where Lennart’s Sámi village Unna Tjerusj has its calving grounds, is where he really feels at home. A few years ago, we met at the Jokkmokk market. It had snowed heavily that winter and the spruce bows were hanging low under the weight. Every tree in the forest was white with snow. I remarked at the beauty of the landscape. Lennart said that he was very concerned about what it would mean for the reindeer. I stood there like an idiot. It occurred to me that the reindeer probably didn’t care about the lovely scenery. But if they did, they wouldn’t complain about the spectacle. A forest becomes a cathedral of light. Lennart explained that the snow on the trees covered the lichen. And when the reindeer ate the lichen they ingested mostly snow and water but not very much lichen. Although their hunger may have been stilled, they would derive little energy. Several weeks later I read that many reindeer had succumbed to starvation that winter. I though of Lennart. How sad he must have been. He didn’t need to hear any passing remarks, like ‘there’s always some problem with the reindeer. Either there’s too much snow or too little’. I thought of calling him to offer my condolences. I never did. There is no adequate way of explaining what the reindeer mean to the Sámi. In an age of consumerism and credit institutions the reindeer doesn’t quite fit in. Perhaps, for the sake of comparison, I could liken the reindeer to oil in a petroleum-based economy. But that is a rather simplistic view of something so beautiful. It would reduce us all to neurotic consumers. For the Sámi people and the Sámi culture, the answer is so much more complicated. 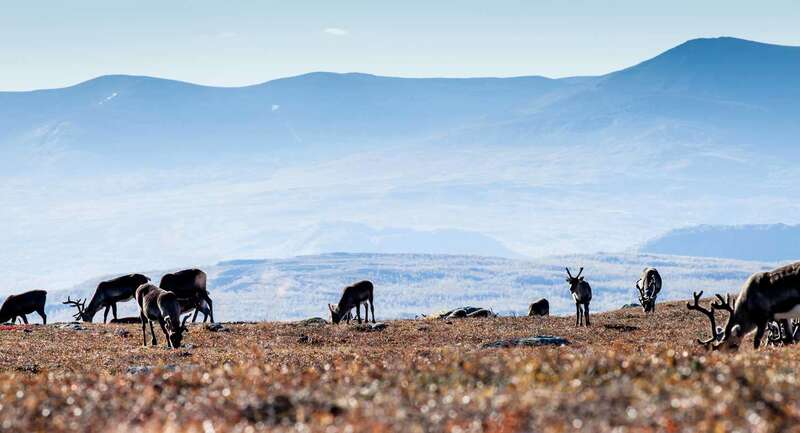 The reindeer, its habitat and its migration have given rise to the entire Sámi culture and, thereby, even Sápmi, the Sámi homeland. Carl-Johan Utsi is a photographer and reindeer herder in the Sirges Sámi village, whose lands include parts of Badjelánnda in Jokkmokk. He lives in symbiosis with his animals and his camera and with a foot in two worlds. 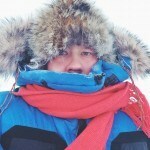 There are at least two other Utsis who are professional photographers in Swedish Lapland. I ask Carl-Johan if they are related. – Distantly, maybe. Among the Sámi, Utsi is very common. Many share the name. – I didn’t realize that. 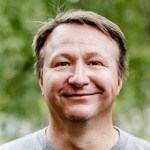 Carl-Johan has studied engineering physics with specialization in space technology for five years at Uppsala University. Or, as he puts it, he has a ‘helluva lot of credits’. But, he says that his studies have benefited him more than he would have expected since he decided to return to reindeer herding. – Study involves problem solving, but so does reindeer herding. Carl-Johan says he wanted to get away, to rebel against the Sámi lifestyle. He thought he could be anything, do a doctorate, solve the fusion problem, and win a Nobel Prize. But, during a break in his fourth year of studies, Carl-Johan’s father said that his boy was doing so well in school that it might be time to sell the reindeer. That cut Carl-Johan like a knife; he’d never really considered it. He wasn’t prepared to lose that part of his life. His father promised to keep the reindeer for a couple of more years, until Carl-Johan had graduated. 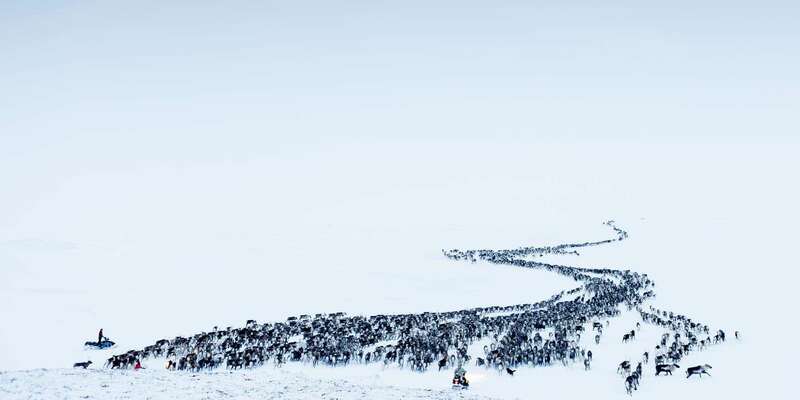 – Life in the reindeer forest is a feeling but, at the same time, it is an absolute reality. 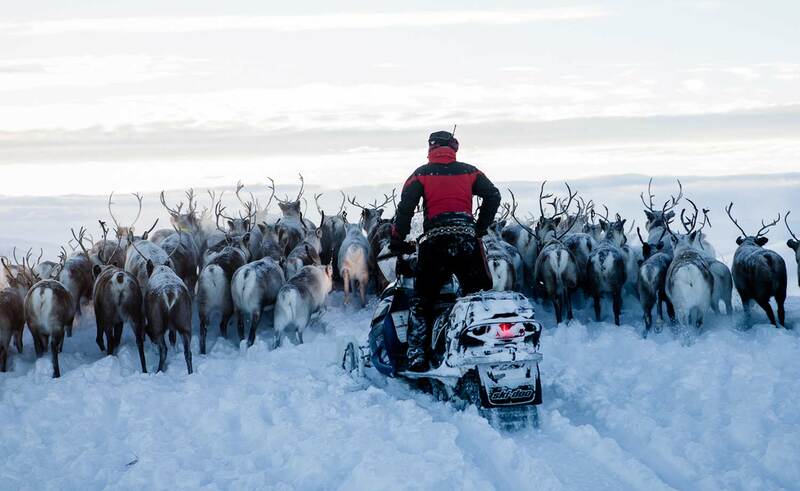 I mean, when you get your snowmobile stuck in soavli – ‘water on top of the ice’ – out on the lake and you have to struggle for a couple of hours, that’s just part of a normal working day in the life of a reindeer herder. Even so, there’s something else there as well, something we have in our genes. – The reindeer is our strongest link with nature. That is my real connection with reality. – Anyone can do a 9-to-5 job; where’s the challenge in that? But try succeeding at reindeer herding. It’s impossible if you don’t understand deep within your innermost being that you are totally dependent on that clacking sound, the sound of reindeer hooves. It’s almost metaphysical. Something I cannot do without. Yes, for me, that sound is purely physical; the thought of not hearing it hurts. – Is that why you chose this – getting your snowmobile stuck in the slush, never knowing if the ice will freeze, constant fear of accidents and trouble – instead of a career in space physics? – I don’t know. It’s sort of weird and ambiguous. In the woods, there are no high demands or expectations; I simply want to be outdoors. And that feeling is wonderfully liberating. At the same time, it’s bloody difficult to make a go of it financially or business-wise. – But you can’t do without it – or? – It’s tough. But if you asked me what the reindeer means, my answer would have to be Visut. – Visut; what does that mean? – Visut is a North Sámi word. For me, it means ‘everything I will ever want or ever need’.